Quickly and easily blow in any fiber type when and where you need it, taking advantage of "fiber on demand" to meet any network add, move, change, or reconfiguration in minutes or hours versus the days, weeks, or even months of pulling in traditional fiber optic cable. At speeds of up to 150 feet per minute 3,000 feet of fiber can be blown with the Air Blown Fiber system in just 30 minutes, using only 2 installers. It typically takes one 8-hour day with a minimum of 4 skilled installers to pull 3,000 feet of fiber optic cable. Blow fiber bundles quickly and easily even in hard-to- reach, limited access, or secure areas. Eliminate the risk of having installed obsolete fiber that no longer meets your network's growing requirements. Air Blown Fiber allows you to immediately upgrade your network while protecting it against potentially rapid obsolescence. Save your initial fiber investment. 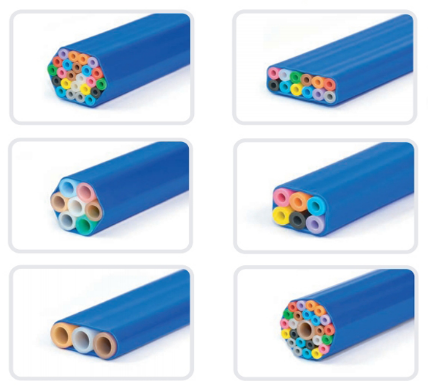 With Air Blown Fiber, fiber bundles can be blown out quickly and easily and replaced with a new fiber type in virtually minutes —allowing you to reuse the old fiber for another application in your network. Plan projects in hours or days, instead of months or years in advance — allowing you to have total control of your plans and budget by Paying-As- You-Go… one project at a time. Enjoy the freedom and network control that Air Blown Fiber offers, eliminating the headaches of forecasting technological changes and the future requirements of your network so you can pursue the other demands of your job — knowing that with Air Blown Fiber you will experience instantaneously quick upgrades, fast project turnaround times, elimination of construction coordination, less downtime, and lower departmental costs with continuously positive ROI.